Himmlische (aka "Matty") joined our herd in early 2000. She was imported from Germany as a young horse. At the age of fourteen, Matty was inspected for voluntary marks by Dr. Robert Baird and received an impressive score of 54 (8, 7/8, 8/8/7, 8). Before coming to Sovereign Farm, Matty produced several outstanding offspring that have gone on to successful performance careers, and has continued her excellent production record here with us. Among her performing offspring are the mares HALF MOON BAY *Pb* (by Tropez) and HIMMELA (by Sigurd), both bred by Barbara and Bradley Sackett. Half Moon Bay *Pb* is currently competing at Fourth Level in dressage with consistent scores in the mid-60's. In 2004, Half Moon Bay was the ATA Champion Third Level Horse of the Year. Himmela is competing successfully at Third Level and is close to earning her own Performance Bronze title. Matty's son, the gelding HUNTINGTON (by Samurai II) competed at Second and Third Level last year. 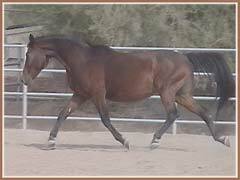 HAUTE COUTURE, another daughter by Sigurd, was sold to Canada, where she produced the Canadian approved Trakehner stallion HOLLISTER (by Dalnomer). 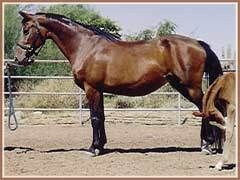 Both Huntington and Haute Couture were also bred by the Sackett's. At Sovereign Farm, Matty produced the powerful mare Hadley by Kaspareit. 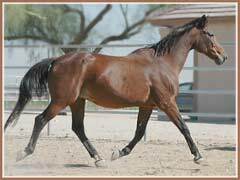 Hadley was the 2003 Champion ATA Two Year Old Filly and will compete in the 2006 ATA Futurity. Ultimately, she will replace Matty in our broodmare band. 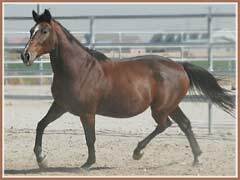 In 2003 and 2004, Matty produced two outstanding colts, Hugo and Horatio, both by the ATA approved Arabian stallion Aul Magic. Hugo sold to a wonderful home in Colorado, where he will pursue a dressage career with his owner. Horatio is started under saddle and is available for sale. 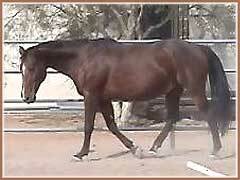 He will make an outstanding competitor in either open or half-Arabian classes.